The E4 through Catalonia was worse part of the whole trip. Accommodation was hard to find and I had to walk very long days. Worse still I was constantly missing the trail. Maps in Spain don't show the routes and unless you have a guide or a good GPS trail then it's easy to take a wrong turn. Of course I was never seriously lost but constant minor mistakes made long walks even longer - really frustrating and at times depressing. Must admit that I couldn't understand why the E4 left the GR7. Having followed the GR7 all the way from Andalucia, it turns east at border with Catalonia and heads down to the coast along the GR8. It then heads along the coast via the GR92 to Tarragona, heads north via the GR172 to Montserrat and then onto Alp and the border with France on the GR4. Meanwhile the GR7 carries onto the Pyrenees ending up a few kilometres from the GR4. The E4 through Catalonia does visit some amazing places, in particular Montserrat and Tarragona, but the walking itself was mixed. You are not walking around or through a particular mountain range and it's certainly not the most direct way to get to the Pyrenees. Catalonia is a busy place and although there is some lovely countryside you also have to cross some major transport corridors and built-up areas. My negative view of the E4 through Catalonia is influenced by the extent to which I had been enjoying the GR7, particularly the last few days through Castellon. It was a change however and a change might be as good as a rest. I was entering a different sort of countryside and I was also entering Catalonia, a particularly distinct part of Spain with its own language and cultural traditions. The lack of love between Catalonia and the rest of Spain is manifested in many ways including the intense rivalry between the Barcelona and Real Madrid football clubs, something I had been observing throughout the trip (six El Clásico games when I was there). I had put my schedule together using the information on the La Federació d'Entitats Excursionistes de Catalunya (FEEC) , the Catalonia Climbing and Hiking Association, which identifies all the major walking routes and gives you stage distances, walking times and altitude gained and lost. Great help for planning the route but as it turned out only limited help when you are actually doing it - why can't they go the next small step and actually publish a GPS route! 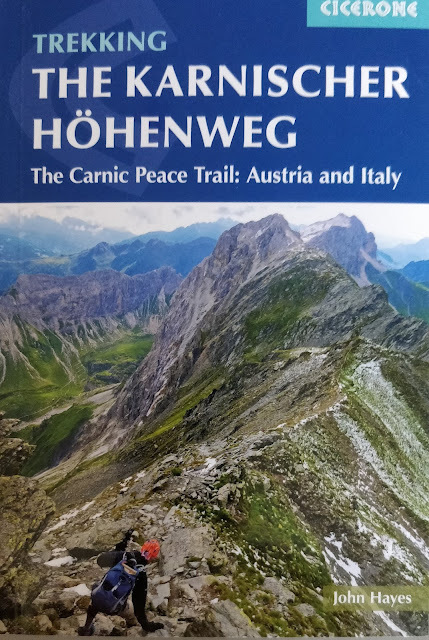 I started walking through Catalonia on the 24th of April and got to Alp 16 days later on May 9th. I stopped for a day in Tarragona and had another rest day at Alp before crossing the border. The first part of my Catalonia trip was from El Boixar down to Mol l'Abad where I stayed at a very nice holiday centre. Was driven there by the lack of accommodation on the main GR8 route which runs through the mountains just to the north. Was aiming to re-connect with the GR8 at La Senia but ended up walking all the way along the road to Ulldecona - miserable, was missing the mountains already. Found a good hotel and got there early so some compensations. Next day was much better, really nice walk and interesting as well. The walk takes you up the Sierra de Montsia to la Foradada (684 metres) which has amazing views of the Ebro Delta, the coast line to the north, and all the way back to Penyagolasa to the west. Really interesting information boards describing the impact of rural depopulation in the 1960s. After the climb and the views you walk down through ancient Mediterranean woodland, onto the delta and then into Amposta, a fairly large town with lots of accommodation. After Amposta the trail is completely flat but still quite nice. The first part takes you across the intensely farmed delta and then, after Ampolla, along a lovely coastal path to L'Ametlla de Mer. Stayed at the Hotel del Port, very reasonable. The coastal walk to Cambils was a bit more mixed. Some nice stretches, but also some horrible diversions around gated harbours (Sant Jordi) and a large diversion around a nuclear power station (and over/under railway lines and motorways). There were long stretches of concrete coastline with blocks of holiday accommodation running right up to the shore. 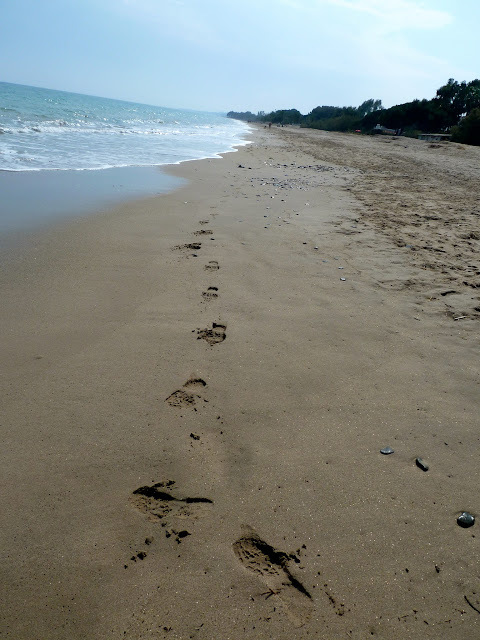 Nice stretch along the beach after L'Hospitalet de l'Infant but a lot of hard surface walking over the whole day. Cambils itself was a tiny fishing village in the sixties but is now a huge resort. Next day into Tarragona was just awful although I missed the route and possibly made it worse. Essentially you have to get around a huge port and chemical works to the south of the city (if you are English, think Middlesborough) and following GR signs in a built up area is not easy. Despite the chemical works to the south Tarragona itself is a wonderful city. I rested up there for a day and there was lots to see - it has a huge Roman heritage and is a UNESCO world heritage site. Would love to go back there again but would definitely choose a different mode of transport! Ideally you would stay at Santes Crues the next day but I couldn't find any accommodation when planning the walk (when I went there next day it looked like there was some) and instead diverted to Valles. Not bad countryside but not stunning either. Initially through scrubby forest and then back to back vineyards. El Cattlar on the way is a pretty little town. Santes Crues, or Santa Maria de Santa Creus to give it full title, is an important monastery dating back to the 12th Century. It was shut when I was there but looks like it would have been well worth a visit. 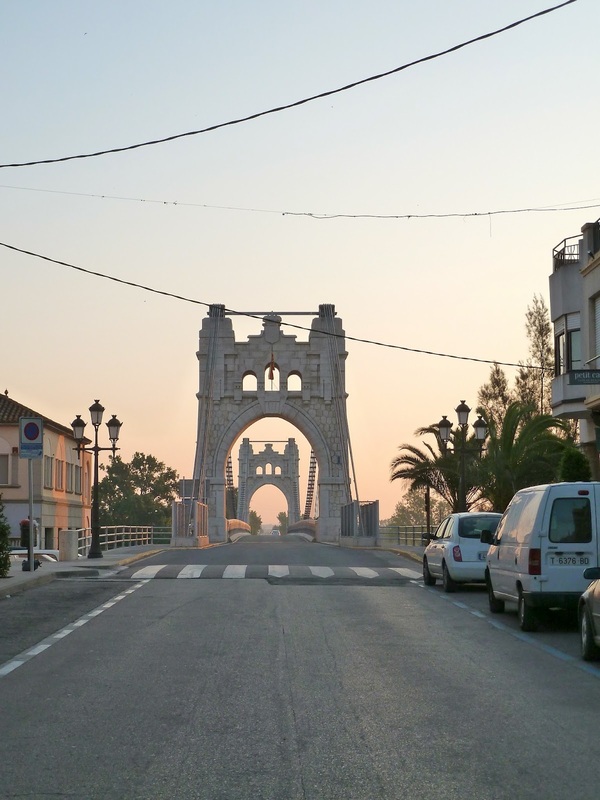 The ideal place to stay next day would have been St Joan de Mediona, a nice looking town with a historic centre. Instead I had to go to Capellades about 5 kilometres to the north. It was a long walk with about 700 metres of climb over the Col de Rimbalda and then a drop down again into the next valley. Nice countryside. I went to a distant suburb of Capellades but was rescued and given a lift directly into town. Assisted by a short train journey I rejoined the route at Peira and walked onto the next historic highlight, Montserrat. The walk to Montserrat was had some tough bits crossing a series of steep sided gorges which had been cut into the soft loess at the bottom of the Montserrat mountain range. You do have to walk through a large suburb before you finally get to climb up to the Montserrat Monastery which is a 600 metre climb with great views. 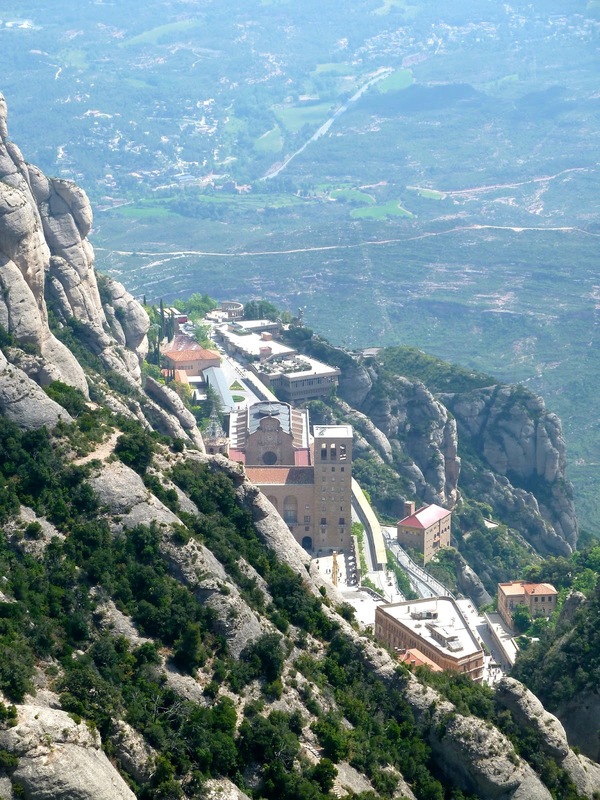 The Montserrat Mountains are a spectacular feature, weirdly shaped and high above the surrounding countryside. The colour and texture of the rock are like ancient concrete and the shapes are reminiscent of Gaudi. The Monastery itself, with its famous Black Madonna, is an important focus pilgrims and a key symbol of Catalan nationalism. I stayed there for a day and walked to the top of Sant Jeroni (1200 metres) - the train, funicular and buses bring up the daytown crowds but it's empty in the evening. The next destination was Navarcles (near Cabrianes) a 42 kilometre walk which was nice at either end but unpleasant in the middle when another busy valley spiralling out from Barcelona had to be crossed. You go on a huge detour to get inside the Parc Natural de Sant Lorenc and then walk along a really nice gorge before finally arriving at Navarcles. Really struggled to find accommodation but ended up in the Hostal Montane which was great, very cheap and very authentic. Driven on again by the lack of accommodation, next day was another huge walk (51 kilometres) all the way to Santa Maria de Merles. The first hour or so is not pleasant involving a walk up to Cabrianes through a fairly busy industrial valley. After that things improve and the route takes you through a very nice pastoral landscape - lots of old farmsteads and isolated churches. Eventually you get to the tiny settlement of Sant Pou de Pinos from which point you head west and then east, again in a huge and frustrating detour before arriving at the equally tiny settlement of Santa Maria de Merles. Stayed at the wonderful Casa Escrigas - and enjoyed home made everything. The walk next day was supposed to be a short one but was again frustrated by really poor waymarks with one memorable sign sending me completely in the wrong direction. One of the problems I faced today was intersections with other GR routes - unless you spot these, work out which is the right one, you can easily find yourself following white and red markings in the wrong direction. If it wasn't for the frustrations of getting lost, today would have been an excellent walk, the scenery is good and Borreda, a lovely old mountain village, is a great place to finish the day. Stayed in the Cal Bardolet which was OK but a bit expensive. Great walk to La Pobla de Lillet, mostly in trees but in early May the trees were at there best. The highlight was the climb up from Castell de l'Areny to Les Pilones (1700 metres) followed by a walk along an upland valley. The GR4 is supposed to be an ancient transhumance trail but the climb up to Les Pilones felt a bit steep for a herd of cattle. Stayed at La Pobla de Lillet, a slightly run down mountain resort town home to a Gaudi garden (Artigas Gardens) and station for the Spanish Yellow Train (there is a French one on the other side of the Pyrenees). I stayed and ate at the Hostal Pericas which was cheap and cheerful. The walk to Alp was the last full day in Spain and another good one. Wasn't as tough as I had anticipated and I needn't have left at the crack of dawn. There was a big 1200 metre climb up to the Coll de Pal but it was gentle and along a lovely valley with great views. Not quite so nice on the other side, horrible ski runs and scarred mountains but seeing the snowy peaks on the other side of the valley, in France, was encouraging. Stopped for a day in the ski resort of Alp staying at off-season prices at the Hotel Roca - very nice. Just a short walk across the valley bottom to Puigcerda and France. Thanks for all the great distillation of your route through Valencia and Catelunya.Think I'll stick with the GR7 in the latter. John is quite right, the GR7 is the best trail for crossing Catalunya and the Pyrenees through Andorra. Also the first part of France is very nice indeed.